On April 24th, a dream will come true for many top college football players across the country, as the NFL will hold its annual draft. With an exciting crop of prospects waiting to show their stuff on the professional gridiron, no wonder fans and collectors are buzzing. And just one month after that special weekend, Topps will release its first football set of 2004  Topps Draft Picks & Prospects. 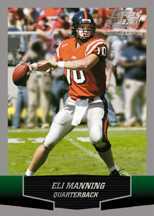 Get the first officially licensed rookie cards of Ole Miss Eli Manning, USCs Mike Williams, Miami of Ohios Ben Roethlisberger, Pittsburghs Larry Fitzgerald, Miamis Kellen Winslow, Jr. and fifty other 2004 Draft Picks featured in their collegiate threads. Collectors will also uncover exclusive relic programs such as Big Dog Relics and Patches featuring pieces of jerseys from the 2004 Senior Bowl, and Old School Dual Relics highlighting a rookie and a veteran from the same campus. Draft Picks & Prospects will also include one of the coolest autograph cards ever featured in a football producta triple signed card featuring Eli Manning, Peyton Manning and their father, Archie Manning. Collectors can also find this trifecta in silver (#d to 50) and gold (1 of 1). 20 Rookies have also added their penmanship to the Class Marks autograph program. Topps is the Official Trading Card of the NFL Draft. Each 5-card pack of 2004 Topps Draft Picks & Prospects Football, which guarantees a rookie card and a chrome parallel card carries a $3.00 SRP and hits shelves May 24th.